U.S. employers added 165,000 jobs in April, and hiring was much stronger in the previous two months than the government first estimated. The job increases helped reduce the unemployment rate from 7.6 percent to a four-year low of 7.5 percent. WASHINGTON (AP) — U.S. employers added 165,000 jobs in April, and hiring was much stronger in the previous two months than the government first estimated. 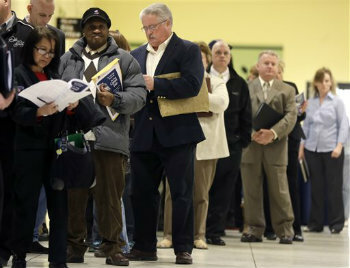 The job increases helped reduce the unemployment rate from 7.6 percent to a four-year low of 7.5 percent.